SPORTS MOMENT: January 3 2003, Tempe Arizona, Sun Devil Stadium. That's the moment you go straight cash homie. We had trouble covering the TE's this year too. I remember against TSUN they scored a touchdown where no one went with the TE but 2 guys went with the fullback. Commented on "You Guys Are Going to Win a National Championship in the Next Two Years." 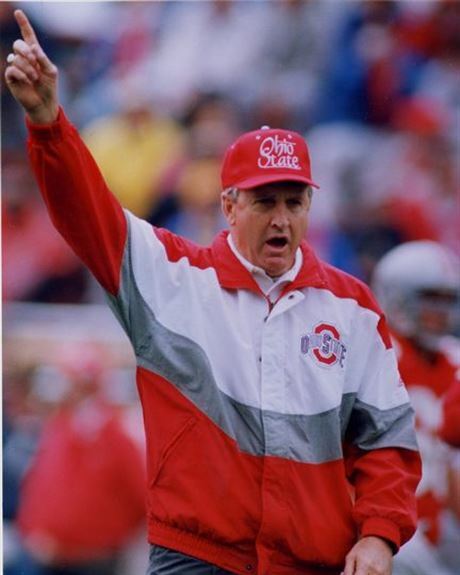 Part of what made Jim Tressel such a boss was that he said no thanks to the typical football coach attire. I miss that distinctive, classic look. Got me by 7 seconds. Commented on NFC Divisional Playoff Game is Like Watching a Ohio State Alumni All Star Game. I don't know. I think he will need to i mprove his mechanics (feet) and ability to read defenses and manage games. But if he is drafted by a team with great position coaching and patience, I think Haskins has a high ceiling. Unrelated but my favorite tidbit about the coaches you mentioned was that Dennis Franchione left TCU for Bama and then left Bama after 2 seasons for aTm. This was after he had Bama at 10 wins. His departure lead to the Mike Price situation and eventually to Mike Shula. I love anyone who can troll the Gumps in such epic fashion. I didn't know all of that about how pathetic BC's schedule was. Wow. Commented on Who is the Bigger Heisman Snub: Byars or Haskins? You underestimate how bad that pathetic front office is. The Bengals went to the playoffs 7 times from 1968-1991. Not great, but they did make 2 Super Bowls and should have won 1 of them. Enter Mike Brown. 1991-2003 is they are the worst franchise in sports. Marvin is hired in 2003 and immediately takes a 2-14 team to .500 2 seasons in a row, then has the best team in the AFC. He then takes the team to the playoffs 7 times in his tenure which is the same number of playoff appearances as they had in the 32 years before he became the head coach. With any other team Marvin likely wins a Super Bowl. Commented on Mike Munchak to Coach the Bengals? All of that stuff you don't love is just so they can say "this guy has all of this responsibility so we need to pay him more". That's it. They know their role and who the boss is. All we need is an average defense and we make the playoff this year. The offense is going to score points, we just need to slow teams down. The only college experience he has: Michigan State graduate assistant 1991 Ohio State LB coach 2017-18 That's it. The rest of his career was in the NFL. I bet he's a decent NFL coach, but it's quite obvious from the play of his unit the past 2 seasons that he isn't a good fit for the college game. And that's ok, not everyone is cut out for different levels of coaching/teaching. Many of the best high school teachers would struggle teaching 1st grade and vice versa. Commented on Well That Didn't Take Long. Bill Davis Lands NFL Job As Cardinals LB Coach. On an MgoMeltdown thread several posters mentioned that he didn't return with the team on the plane after the Peach Bowl. Commented on Mike Valenti: What the Hell is Going on in AA? There have been rumors for a couple weeks of stuff going on behind the scenes and that players and/or coaches want out. Coach Day probably just got a hankerin' for some crayfish and hey he has access to a private jet now. I don't remember hearing an announcement and I can't find anything saying that. I don't believe in fonts for my sarcasm.